We currently live in a historic property where my husband is site coordinator and guide. There are three properties on the site (Heritage Plaza)–two of them open for tours, and then the one we live in. Much of the history is related to the faith tradition I belong to…but not all. There is also significant history associated with our town. But because the property is owned by the church, funds are sometimes in short supply to take care of all the needs of all the historic properties. And that’s where volunteers come in. There are many folks in our denomination who enjoy traveling in their RVs. But they don’t want to just sight-see. Many of them use their traveling as an opportunity to provide volunteer service–and we have been recipients of that recently. We have had volunteers at the site for the past couple of weeks. They have been replacing a rotting porch, stripping and painting doors, replacing a picket fence, providing handicap accessibility to one of the properties, painting buildings, updating plumbing, tuck-pointing and repairing masonry… And these are not young folks! They range in age from their 60s to one volunteer who was 90! There is no way that we could afford to pay for all the work they have provided for us. They’re not the only volunteers I come in contact with. In my work at my denomination’s headquarters, I deal with volunteer staff organists, volunteer guides, volunteer greeters…people who have gifts and talents they want to share. It seems ironic that just as the season of Lent gets started–a time when we may be spiritually journeying through some dark places on the way to (and through) the cross–the earth physically jolted us into dark places. I live in an area that is prone to tornadoes, and I would much rather deal with them than earthquakes. There is nowhere to run in an earthquake! I’ve seen earthquakes portrayed in movies…have imagined them in my mind…have even seen pictures of the devastation caused by recent earthquakes. I’ve heard about tsunamis–my first memory of reading about them was in James Michener’s Hawaii, but I couldn’t imagine what they were really like until pictures of the tsunami that hit Indonesia a few years ago. But even all that didn’t prepare me for the pictures I saw when I turned on the TV this morning to catch a bit of news before going to work. To see huge buildings sway…and collapse….and to watch cars being tossed about as though a 2- or 3-year old was throwing them about wildly…to see large boats madly bobbing about on waves that were driving them into bridges…and to hear reports that the tsunami waves were strong enough to reverse the course of a river was bad enough. But then to watch–and see it replayed–the river of mud, water, and debris that was the tsunami moving onshore was almost like watching some amorphous evil force oozing onland destructively. ﻿﻿Last night we watched the largest active steam locomotive (﻿﻿﻿Union Pacific’s Challenger 3985) in the world come through our town. Wow! 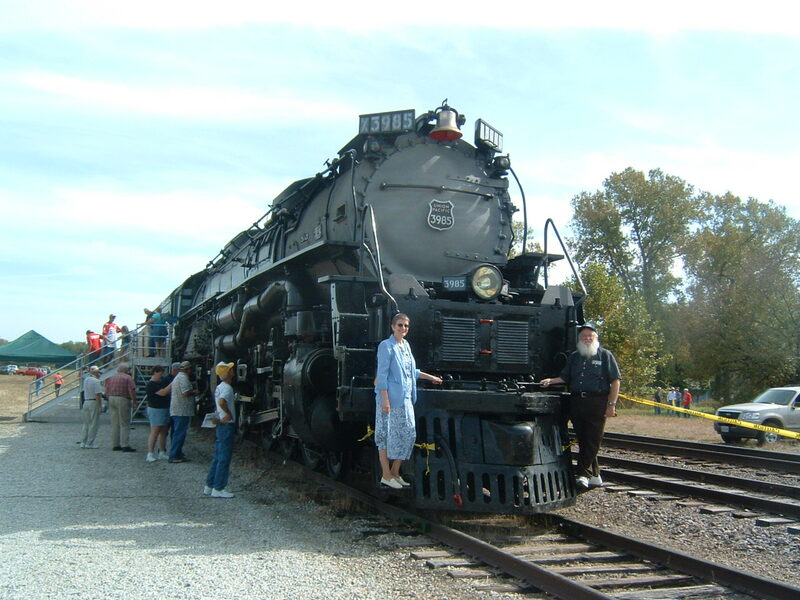 I remember steam locomotives as a child–and being scared of the release of steam and the sound of the whistle. I lived in England, and the local train station was a lot like the station in the Harry Potter films–covered, with lots of concrete to bounce the sound off of. And it bounced! So it was fun to see the engine yesterday. We had seen it in another town earlier in the day, taking advantage of the opportunity to peer in the engine cab and see all the gauges…and feel the heat. But when it came by last night, it was really moving! We had thought it would be on the farther track, moving slower. Nope. It was on the closest track, and they were really moving to get to the next stop where it would be on display. Our grandson was with us at the station–and it startled / scared him. I don’t think he realized how big it was going to be–or how much air it would be moving as it came by–and he retreated very quickly back closer to the station. I’m glad we have cleaner transportation in many ways, but it was great to be carried back in time! 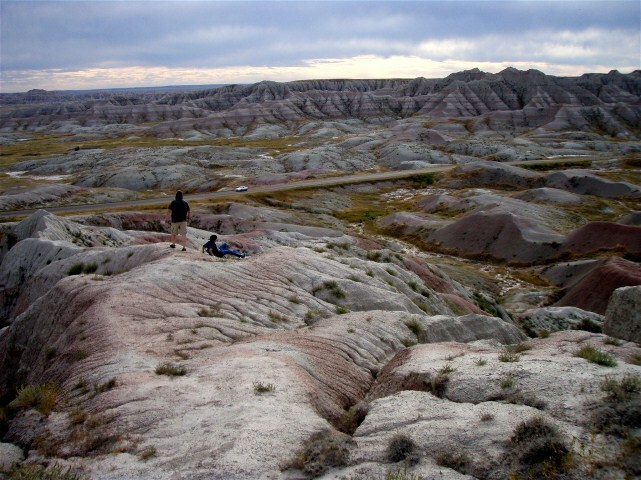 We recently took a trip out to Washington, driving through the Badlands…stopping at the Custer Memorial and Mt. Rushmore on the way out, and Yellowstone on the way home. I’d been there before, but it had been a long time, and I’d forgotten just how stark–and yet how beautiful–part of that country is. We often drove for miles, seeing only an occasional house. Small towns…where you could buy the basics you might need, but you’d need to plan an all-day trip that would include significant driving time in order to do major clothes / grocery / appliance shopping. Lots of deer…periodic sightings of buffalo…bringing memories of what used to be. At night the stars were brilliant, because they didn’t have to compete with all the city lights that are so prevalent where I live. We stopped for a while one night to allow our grandson to see what it was really like to see stars. There’s a part of me that would love the solitude…but another part of me that would go stir-crazy after a while. I would not have made a good pioneer wife! There’s an incredibly stark…awe-ful…lonely beauty about this country. I especially noticed it last night as were driving in. Houses few and far between–little light sources in the middle of the incredible darkness of night. It would take a special kind of personality to live comfortably out here! I’m glad for the visit–and while part of me would like the solitude, I would also find it very difficult. Last night I had the opportunity of hearing the International Flute Orchestra in their first public performance in the United States. This group of professional flutists travels each year to different countries, working with flutists in those countries and working to improve relationships between the host country and the United States. I thought I knew what to expect–but I didn’t! I knew what a flute looked like–doesn’t everyone? I realized, though, that what I was familiar with were the piccolo and the C flutes. 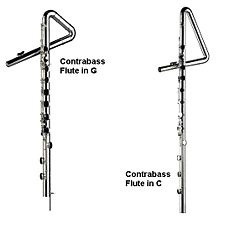 I’d never seen a contralto or contrabass flute! They’re an unusual (and rare) instrument–apparently quite expensive and a challenge to travel with. The flute orchestra had 3 of them! They played music around the world–arrangements of classical pieces, folk songs, and original works written specifically for them. We were fortunate in that their national convention had just ended in Kansas City, and the orchestra took advantage of the opportunity to perform on the Dome and Spire Series, sponsored by Community of Christ. I thought that maybe after a little while I’d get tired of hearing the flute sound, but the variety of instruments (piccolo, C flutes, altos, bass, contralto, and contrabass) provided a depth of sound I’d never heard before. Some of the pieces I was familiar with in their original orchestral versions–and wondered what they would sound like being played by only flutes. Yes, it was different in some ways, but fascinating to listen to. Apparently flute choirs and orchestras are becoming quite popular in the United States, although most are not as large as this group–which is composed of approximately 40 professional and/or college-professor musicians from the United States and Canada. I’d heard a flute ensemble before–6 flutes (the “traditional” flute), but hearing this mix was just incredible. If you ever get a chance to hear this group–or any other flute orchestra ensemble–I’d encourage you to do so. And go with an open mind–you’ll be surprised at the range of sounds you’ll hear!! You never know when or where or how you’re going connections with someone! When I flew back from California (attending the Hymn Society Conference and visiting with my brother and his partner), I was on the side of the plane with two seats. My seatmate was an elderly lady who–at least at the first part of the flight–didn’t seem interested in visiting. She was pleasant enough, but she spent much of the time dozing. That didn’t hurt my feelings. I had some reading I wanted to do, and I was really rather tired from all the activities of the last couple of weeks. However, about halfway through the flight, we passed through some incredibly white clouds–clouds that looked like you could bounce on them. My seatmate was studying them, and so was I. She turned and made some innocuous comment about them…and one thing led to another. She had an accent, a German one I thought. So I asked her what part of Germany she was from. Her response was that she was actually from Hungary…and now lived the next small village over from where my brother lives. What a small world! My brother had lived in Budapest for several years when he was beginning his teaching career! When I asked her what brought her to the United States, she debated about how much of her story to tell me, and then decided to give me many of the details, historical details I was not at all familiar with. At the Yalta Conference in 1945, when Churchill, Stalin, and Roosevelt basically carved the world into spheres of influence, Stalin was given permission to import “guest workers” from conquered areas under his control. Maria (my seatmate) was the age they were looking for–women between the ages of 17 and 35. She was sent to Russia to work in a mine. When her time was up, she returned to her home, but not for long. The authorities wanted her to go to the surrounding areas, encouraging others to sign up for the guest worker program–telling them what a great experience it had beeen. But she refused. She said she had worked but would not tell lies to other young women. There had been 70 taken from her home town–and 12 came back alive. Her life here has not always been easy–but she still carried a positive spirit, even though she’s had to give up her home and now lives in a nursing home. Connections…you make them at times and in places that are totally unexpected! But what a blessing they can be! !